I'll admit something to you. Before heading to Barcelona, I was quite worried about finding vegan food out there. Let's face it, Spain is known for it's love of dry cured meats and cheese, which is the total opposite of vegan-friendly. 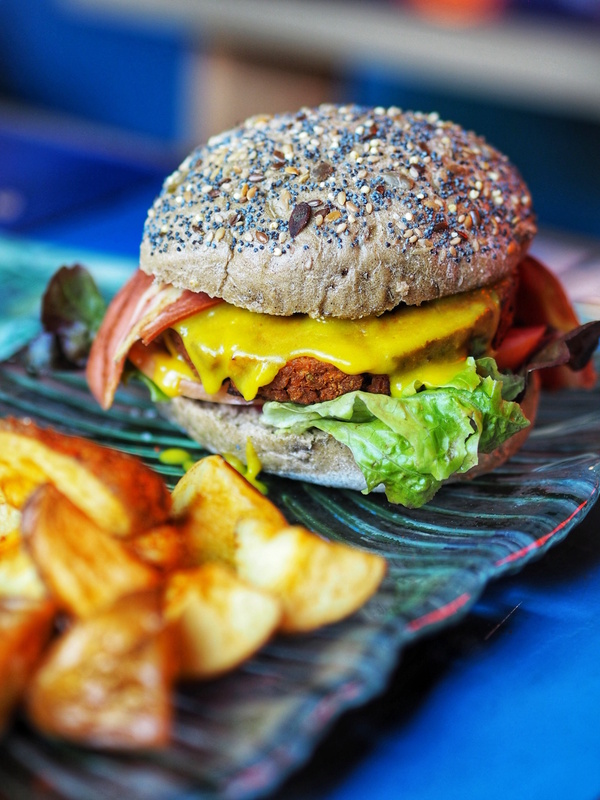 However, after a little research, we were pleasantly surprised to find that the vegan scene in Barcelona is booming! 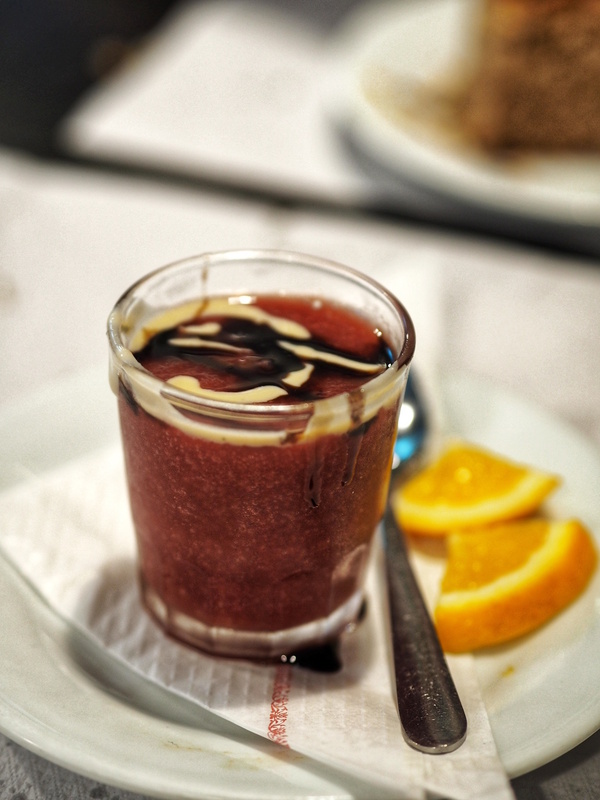 Our first food stop in Barcelona was vegan food & cocktail bar, Floripa, located within the L'Antiga Esquerra de L'Eixample district. We were actually planning on heading to Brunch & Cake upon a few recommendations, but our stomaches were rumbling and the queue for B&C led halfway down the street. In all honesty, from the outside B&C didn't seem that great; it was overcrowded and although the floral-adorned interiors were the epitome of an Instagram cliché, I'm glad we ended up at Floripa instead. 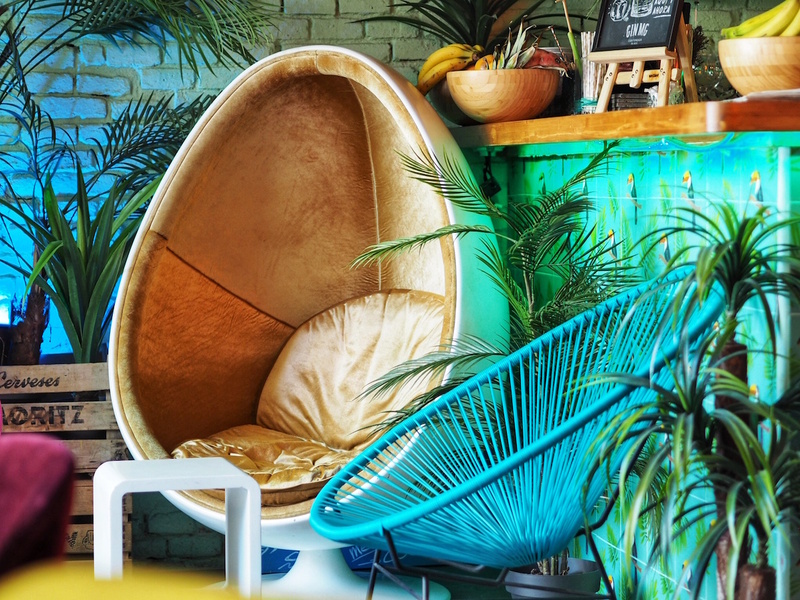 Floripa is a tropical-themed vegan food & cocktail bar bursting with colour, neon lights, green palms and garish prints that scream late 70s - early 80s Miami. We arrived a little after midday and unfortunately they weren't actually serving cocktails at that point so I had to settle for a beer instead. We did manage to get some grub to cure our rumbling stomaches, thankfully. The food menu is pretty small with just three starters, three mains and two desserts but it is 100% vegan. James went for the New York style burger with a meat-like patty (I'm not sure what it was made from), vegan cheese, vegan bacon, onion, tomato, lettuce and a barbecue sauce whilst I went for the trio of tofu tacos with corriander, onion and pineapple with a serving of guacamole. I really enjoyed the vibe of Floripa, despite us being their a little early in the day. I'm devastated that we were too early to try out their speciality cocktails so I'll definitely be dropping by again when we're next in Barcelona. 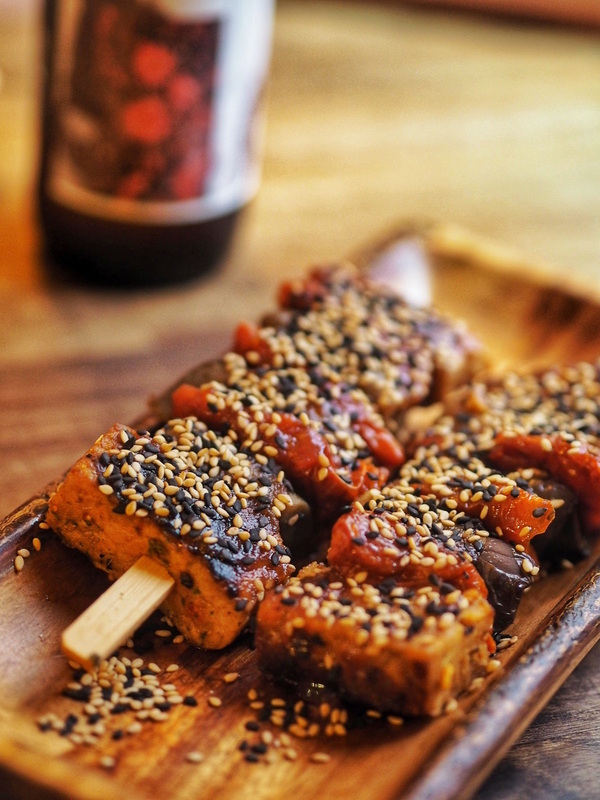 Tempeh skewers from BarCeloneta Sangria bar. It goes without saying, that when in Spain, you absolutely must try tapas. 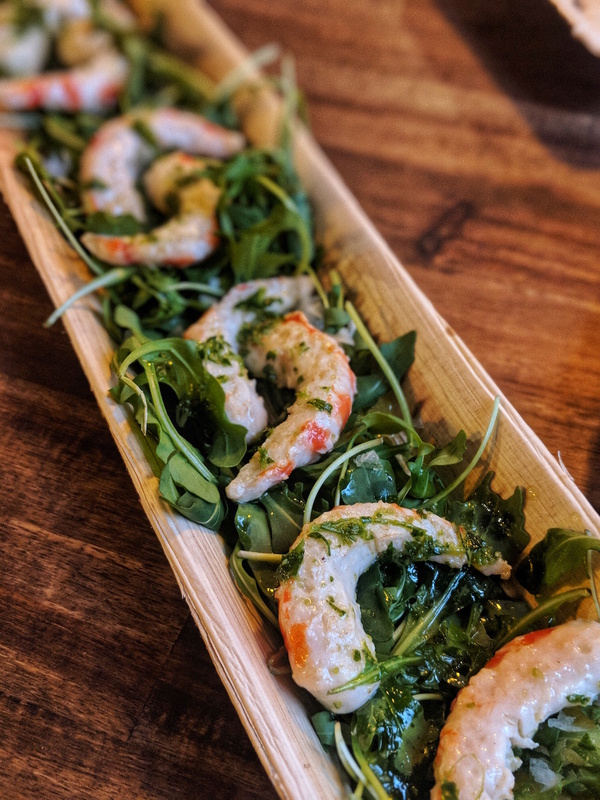 Essentially, tapas - or tapa if you're referring to a singular dish - are small savoury dishes served within Spanish cuisine that are often served alongside alcohol, usually wine. Traditionally, tapas is largely meat and dairy-dominated and not particularly vegan-friendly, which is why I had never really tried it before our trip to Barcelona. 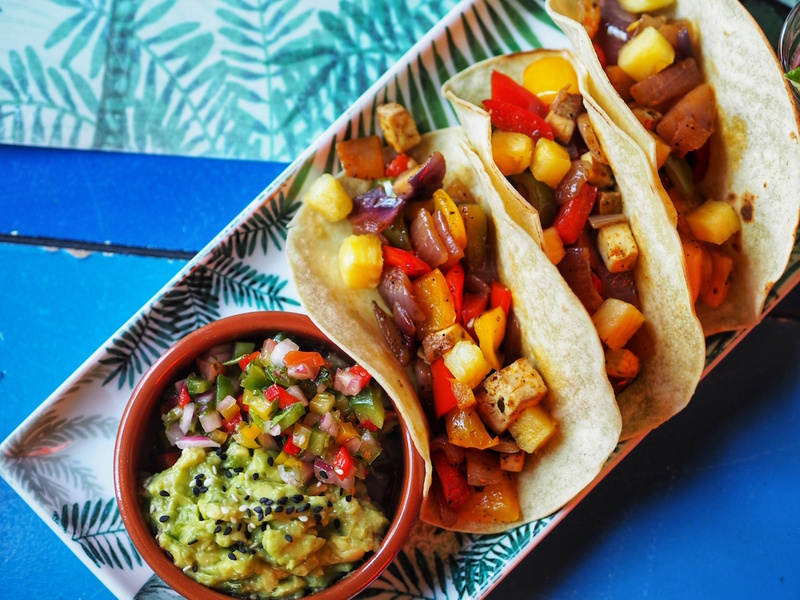 However, luckily Barcelona is pretty well-catered to vegans so as we were feeling peckish on our evening stroll towards Barceloneta beach, we luckily stumbled across BarCeloneta Sangria Bar, which is an entirely vegan sangria and tapas bar. Whilst it was a little on the pricier side compared to some other restaurants and bars we visited, the menu was sensational. 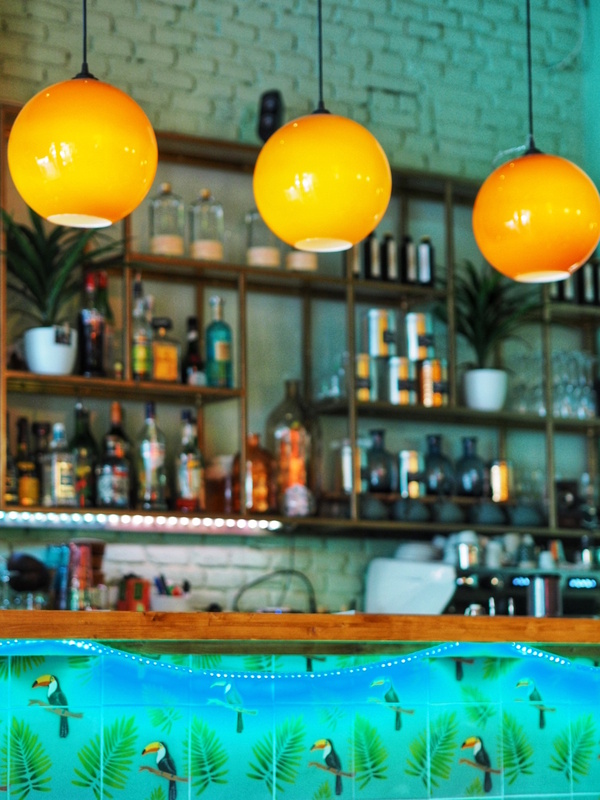 BarCeloneta Sangria Bar have taken traditional Spanish dishes and created entirely plant-based versions, including battered soy "squid" rings! Between us, we ordered three dishes alongside a couple of craft pale ales, including the tempeh skewers with aubergine, sundried tomatoes topped with tomato jam and sesame seeds (8.50€), "the old port ships" best dips served with foaccia (7.50€) and veggie soy "shrimps" seasoned with garlic and parsley (11.25€). Now I never really tend to eat mock seafood because I've never, ever enjoyed seafood in my life. Even when I still consumed meat, I'd never touch anything that came from the sea so I've never seen the appeal of eating any type of vegan food that tries to replicate the taste. However, something came over me whilst we were in this particular bar and our waitress managed to talk me into ordering the soy "shrimps" (probably because they were the most expensive thing on the menu) and y'know what? I gobbled the lot of them. As you can see from the photo above, they're pretty realistic, which was actually a little off-putting but the garlic and parsley seasoning was just delicious. If you're a fan of vegan seafood then definitely swing by here if you're near the beach! Tofu & pesto topped vegan lasagne from Veggie Garden. We kept hearing the name "Veggie Garden" when asking for vegan recommendations (our waitress in Floripa, mentioned above, actually recommended it to us) in Barcelona and during our four days there, we ate there twice. Veggie Garden have two restaurants dotted around the city and we visited both locations. On our first night, we ended up at the Gran Via branch and admittedly we were a little tipsy from one too many beers. However, upon the advice of our waitress at Floripa earlier that day, we ordered from the set menu that includes three courses and a drink (bottle of water or wine, so wine naturally) for just 9.25€! Yep. 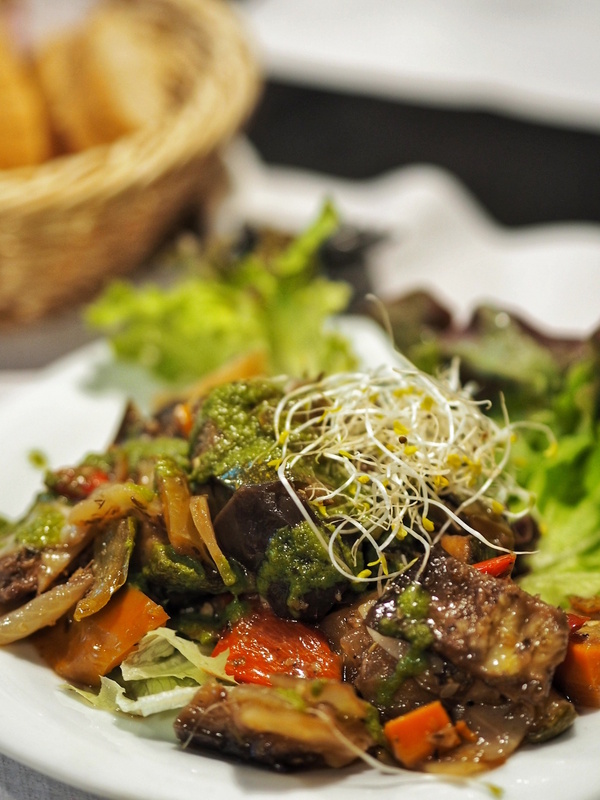 THREE courses AND a glass of wine for just 9.25€! The set menu changes daily and includes a few starters to choose from, three or so main courses and two desserts to choose from. 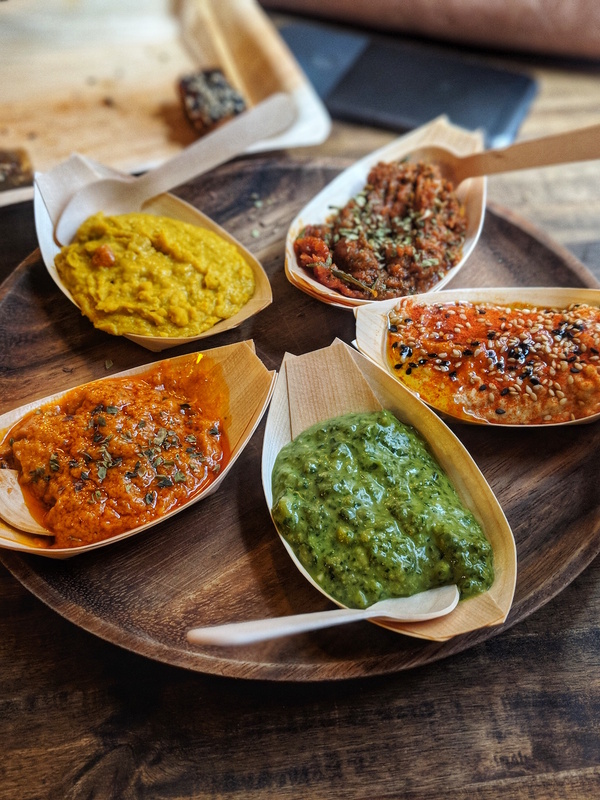 You can also choose to swap out the main course for one of Veggie Garden's thali (a combination dish with basmati rice, two types of vegetables curry, dal, chutney, snacks and papadam). The only problem is that the dishes of the day listed on the blackboard are all in Spanish. Due to our lack of Spanish skills, our waiters patiently listed every dish on the special offer menu to us and offered their own recommendations. Whilst we were in no fit state to really appreciate the dishes presented to us on the first evening, we managed to happily eat most of it. The only couple of negatives I have is that bread served with the hummus for the starting course tasted incredibly stale and was inedible and the "sorbet" that I had for dessert was more like a smoothie shot than actual sorbet. The 'sorbet' from Veggie Garden was more of a smoothie. Our second trip to Veggie Garden's Raval branch was a little more memorable as we hadn't drunk ourselves silly. Once again, despite the huge menu that offers a huge variety of dishes from different cuisines, we couldn't help but opt for the 9.25€ bargain and filled ourselves up their dishes of the day! It's just too cheap to say "no" to. 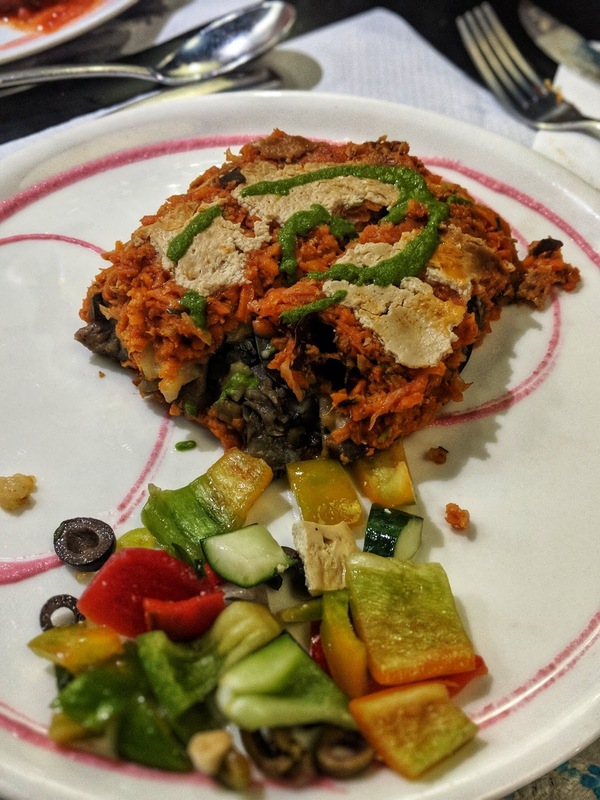 This time I ended up with a tofu and pesto topped vegan lasagne for my main course and a homemade carrot cake for dessert that were both delicious. Veggie Garden isn't particularly sleek or chic; it's colourful, humble and serves up low-cost, wholesome vegan food. 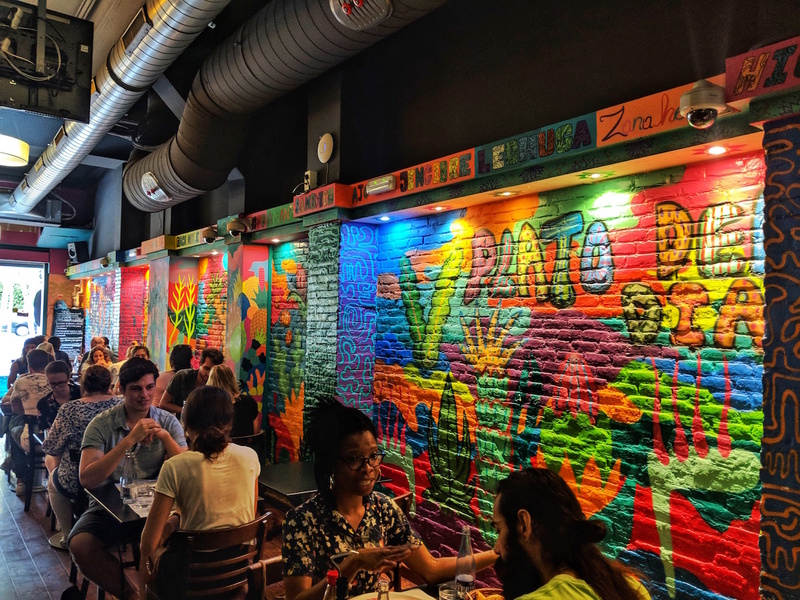 If you're travelling Barcelona on a budget then it should definitely be top of your restaurant hit list. Now onto the sweeter side of things: vegan cake! After being disappointed at the lack of vegan options available at our hotel buffet, we left in search of somewhere nearby to quench my inevitable hanger that was growing with each passing minute. 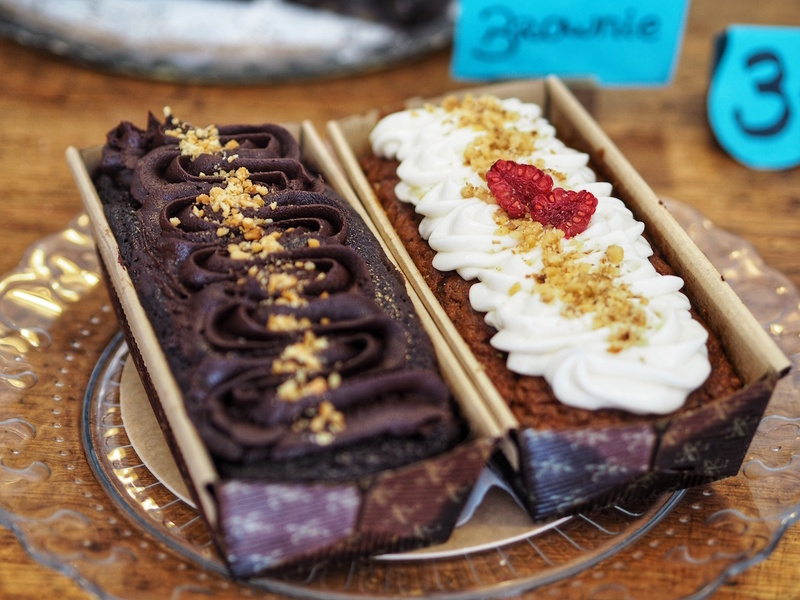 James managed to locate a nearby bakery within Gràcia, called La Besnéta, that was listed to have vegan options but what we discovered was so much more exciting than we ever anticipated. 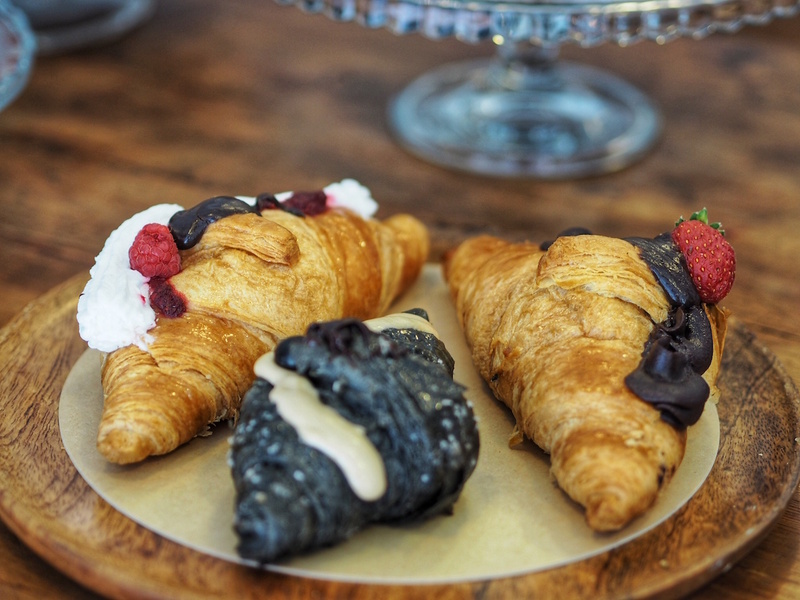 La Besnéta is an entirely vegan bakery that is filled with a huge selection of fresh cakes and pastries baked in-store. 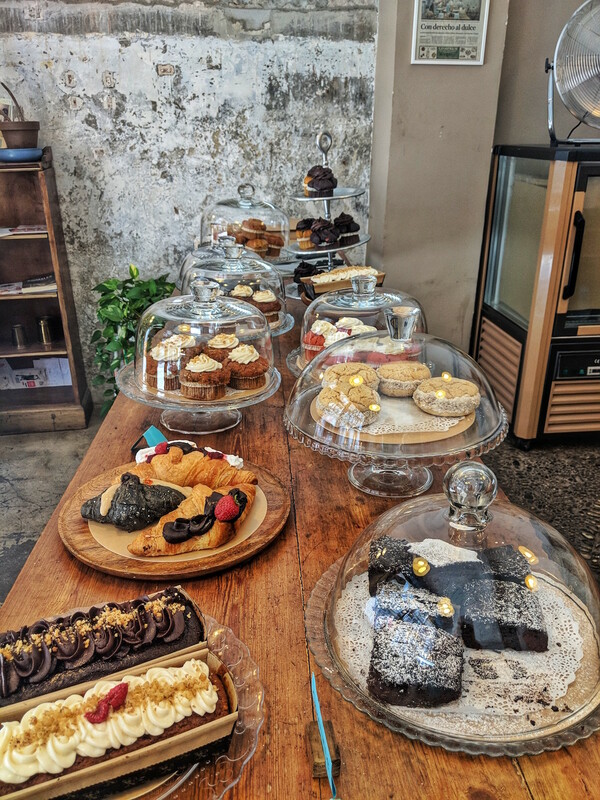 Having never been to an entirely vegan bakery before, I was absolutely overwhelmed with choice and it took us a good 20 minutes to decided on what to eat. The baker behind the counter patiently and thoroughly guided us around everything on offer to help us with our decision. With eyes bigger than our bellies, we came away with two different sweet treats each! Unfortunately, there's no where to sit in La Besnéta and you can't grab a coffee there but we ended up taking our pastries and cakes away in boxes to devour whilst sat on a bench around the corner. For more information on visiting Barcelona, head to the Visit Barcelona website here. I wouldn't have thought that there would be so many vegan food options in Barcelona! Love your photos on this post. 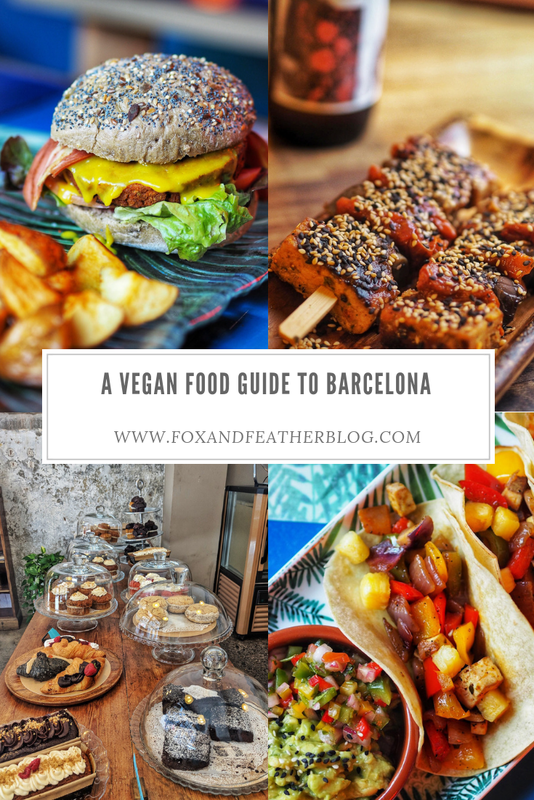 I've come across so many Barcelona food guides, but I've never seen a vegan one before - a very interesting read! That food looks amazing, making me hungry again. I've been to barcelona didn't realise there was that much vegan food there. This is such a great vibe. The food looks amazing and your photos are so vibrant!